The announcement was made by a team using an observatory in Chile. An artist's impression of the planet. ASTRONOMERS HAVE DISCOVERED a close new world about the size of Earth, where a year lasts just under 10 days. At a distance of 11 light-years, Ross 128 b is the second-closest planet to be detected yet outside our solar system with surface temperatures potentially similar to ours. Ross 128 b is very near its star, thus the short orbit. But it doesn’t get broiled because the red dwarf star is cool. The star is also quiet, meaning no radiation flare-ups. That’s encouraging news for seekers of extraterrestrial life. The planet is believed to border the so-called habitable zone. A team led by the University of Grenoble Alps’ Xavier Bonfils made the discovery using La Silla Observatory in Chile. NASA’s exoplanet – planets outside of our solar system – count stands at 3,550. 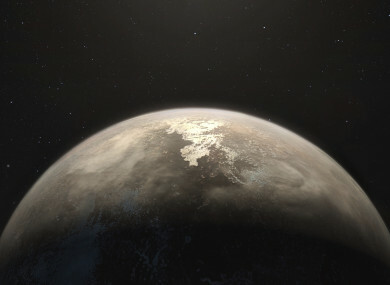 Email “New Earth-like planet found where a year lasts just under 10 days ”. Feedback on “New Earth-like planet found where a year lasts just under 10 days ”.